Jack Bell Gallery is pleased to present an unseen body of work by Beninese photographer, Leonce Raphael Agbodjelou. His ongoing portraiture project, ‘Citizens of Porto-Novo,’ captures the people of Benin’s capital. Using a medium format camera and shooting on location with natural light, Agbodjelou interprets the experience of a generation caught between tradition and progress. 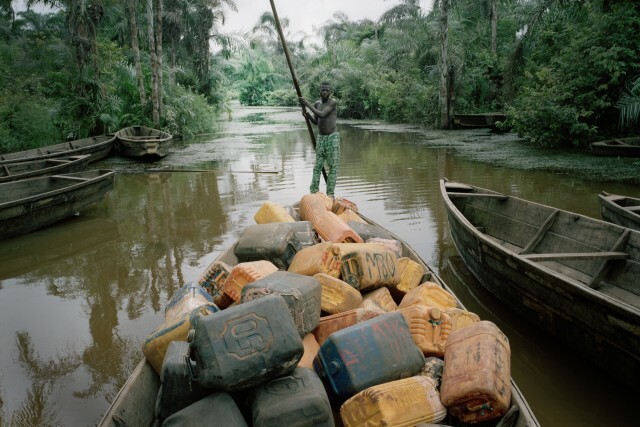 ‘Borderlands’ focuses on the illicit trade between Republic of Benin and Nigeria. Tax discrepancies between the two countries have made the border regions around Porto-Novo a hotbed for smuggling a wide range of commodities. The subjects in Agbodjelou’s photographs are represented with cargos as diverse as petrol, palm oil, Chinese electronics, car-parts & tomatoes. Their daily activities are shown against the background of the environments where they operate and an increasingly porous frontier. Transportation methods range from motorbike, car, boat and custom built bicycle carts used by the polio-disabled peddlers who depend on smuggling as a livelihood. The footprint of the city Porto Novo stretches far beyond the confines of its urban boundaries. This can be seen most clearly in its consumption of energy. Oil is used to power the domestic and business generators when the electricity supply fails. It fuels the buses, cars and, most especially, the motor bikes – the cheapest form of public transport that ordinary people take to travel across the city. Moreover it is used in night markets to light the oil lamps by which the street sellers are able to make visible and sell their wares. But oil has its price; and there is a flourishing illegal market for the much cheaper oil smuggled across the border from Republic of Benin’s neighbour, the oil rich producer Nigeria. No questions are asked by Porto Novo citizens when they travel to the lush forest borderland areas to buy the illicit oil to take back to the city and to sell on for a small profit. No questions are asked about where the oil came from, whether it is simply taken from across the border to sell at the higher price in Republic of Benin evading customs duty, or whether it is the more high risk illegally siphoned off oil from the pipelines that stretch across southern Nigeria. Whatever the circumstances, Porto Novo citizens make the journey to collect and carry back the oil that drives their city, taking their own risks that they may be stopped and have to pay off the police. Yet courier and police know its necessity. Leonce is the founder and director of the first photographic school in Benin and has recently been appointed president of the Photographer's Association of Porto-Novo. His work is currently being exhibited at Brooklyn Museum, New York, Camden Arts Centre, London, and Centre de Cultura Contemporania de Barcelona, Spain. Works have previously been exhibited at the Saatchi Gallery, London, Guggenheim Museum, Bilbao, Des Moines Art Center, Iowa, Grand Palais, Paris, Vitra Design Museum, Germany and Seattle Art Museum among others. Acquisitions have been made by the CAAC Pigozzi Collection, Geneva, Carnegie Museum of Art, Pittsburgh, and Pitt Rivers Museum, Oxford.